There are hundreds of miles of great hiking trails in Upper Buffalo River area to challenge novice and serious hikers. The Upper District or western end of the river provides trails to waterfalls, loops and long distance trails, wilderness trails, and trails to historic structures. The namesake, Buffalo River Trail (BRT), begins near Whiteley Cemetery in Boxley Valley and winds along the bluffs, gravel bars, and banks that cradle the river in its ever-changing embrace. The upper section of the BRT is 37 miles long and ends at the picnic area near the Pruitt access at Hwy. 7. The Old River Trail (ORT) starts at the Ponca low water crossing, intertwines with the BRT, and includes numerous river crossings to excite the more adventurous hiker. The ORT is a shared use trail (equestrian and hiking). Download a brochure with trail descriptions. The Upper Buffalo trail systems offer numerous trails to locations that showcase the natural and human history that have shaped the region. Plan ahead by reading more about the trails at the National Park Service website. Explore the many hiking trails that the Upper Buffalo River region has to offer. Trail maps, including topographical maps, are available on the Maps page of the National Park Service website. If you had to pick one hiking trail to visit, the clear choice would be the Lost Valley trail. It is barrier-free for a half mile, and has resting benches for those who tire easily. The trail is relatively flat for this area, considered easy to moderate. It is beautiful in every season. Clark Creek flows through the valley. In the wet seasons there are beautiful cascades, including two falls, Eden Falls and the Eye of the Needle. The Lost Valley canyon, while not large is beautiful with many excellent vistas. Spring wildflowers are legendary in Lost Valley. In the cold season, elk occaionally can be found along the entrance road near the old Clark homestead. Notes: This is a fairly easy trail and very popular. It is scenic from end to end. In the spring, Lost Valley is famous for the wild flower bloom. Eden Falls is also a popular destination. Suitable for families. It is barrier free for a half mile and has resting benches. Toilets at trailhead located in Lost Valley Campground and follows Clark Creek. Directions: Take highway 43 south out of Ponca, follow the sign for Lost Valley Campground on the west side of the road about 3 miles from Ponca. Other Features: The Lost Valley area is just about in the middle of the best elk viewing in Boxley Valley. Plan to arrive at daybreak or view the elk herd in the evenings. 2.3 mile round trip. Estimated time 1.5 hours. Notes: This is a very popular segment of the Buffalo River Trail. It has great overlooks of the river in many places. This is another easy to moderate trail. It is out and back. On both ends of the trail there are pit toilets. The trail starts at the Ponca Buffalo River Access and ends in Steel Creek Campground. Directions: Take highway 43 south out of Ponca past the highway 74 junction. Take the first left on a dirt road to the Ponca Buffalo River Access and park. The trail head is across the low water bridge and to the left up a grade. It follows the river on the bluffs. Other Features: Just upstream from the Ponca Low Water bridge is a popular Buffalo River swimming hole, a nice place to take a dip after a hike. Just to the right of the trailhead is a path leading to the old Villines Homestead. It is a short side trip and will be of interest to fans of old buildings. Elk are often visible in the first fields just south of the Ponca Access. Notes: One of the most recognizable spots in Arkansas. It is a large outcropping jutting out over a valley with Whitaker Creek far below. STAY AWAY from the bluff lines as they can be dangerous and slippery. There is no emergency cell service. Directions: From Highway 43/21 intersection go south on 21 for 1.2 miles. Look for the brown direction sign and turn right on County Road #9560 (Cave Mountain Road) BEFORE you cross over the Buffalo River. Drive up the mountain road for 6 miles to the trailhead. Limited parking is on the right near the info kiosk and the trailhead begins on the left side of the road. Parking is also allowed along the road. You may need 4-wheel drive in wet weather conditions. Features: Most hikers come to get their photo taken as they stand on top. Notes: One of the most unique waterfalls in Arkansas. The stream drilled a large opening in the overhanging bluff resulting in a waterfall through the hole. The trail begins along a jeep road and heads downhill. It gets a bit steep and there may be water crossings in wet seasons. You will hike along the creek as you reach the top of the Glory Hole. Be extremely careful to stay away from the top of the Hole and keep to the trail to the right to make your way to the bottom of the hole to see the waterfall. Directions: Take Highway 21 south and bear right at intersection of 21 and 16. Keep an eye out for Cassville Baptist Church on the left. Trailhead is .7 miles on the left. Park along the roadway. No parking area is available. Other Features: The trail is in the Ozark National Forest. Best time to see it is after a good rain. Notes: This is part of the Koen experimental forest center. It is an educational opportunity for kids on a short nature hike. It is wheelchair accessible. Directions: Take the entrance road to the Erbie Campground west off of highway 7 and follow it until you reach the center. The building is well marked and on the right side of the road with a parking area. The center has picnic tables and toilets. Other Features: Just a bit further on on the Erbie Road is the Cedar Grove (Glade) picnic area. This is a nice shaded area with picnic tables and fire grates. Directly across the road is another short trail called the Ponds Trail (.4 mile). It is part wheelchair accessible. Also, follow the Erbie road past the campground and you can visit the historic Parker-Hickman Homestead, a popular destination. 2.2 mile out and back trail. Estimated time 1 to 2 hours. Notes: This is an extremely easy trail. It ends at an old log cabin. Toilets available at access. Directions: Take highway 7 south out of Jasper, cross the Buffalo River at Pruitt, turn right into the Pruitt Access area. Stay left and park at the trail head. Other Features: The nearby Pruit Access is a popular swimming hole. Visit the Pruit Ranger station exhibits across the river on the west side of the road. Picnic area with grates, and toilets by Pruit Ranger Station. 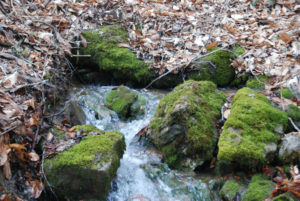 Smith Creek Preserve is 1,316 acres of Ozark forest in Newton County which is bisected by Smith Creek, a tributary to the Buffalo National River. The surrounding forest is home to bats, turkeys, deer, black bear and elk. It is a valuable property because the preserve helps keep the water flowing from Smith Creek into the Buffalo River clean and is a vital connector between the 1.2 million acre Ozark National Forest and the 95,000 acre Buffalo River National River Wilderness Area. The preserve is owned and managed by The Nature Conservancy. The preserve is protected by a locked gate at the end of the parking area just off Highway 21 and is 3 miles south of Boxley Valley Church. The trails are well marked and you will be treated to a wildflower bloom, Elise Falls and the chance to see the 3 springs that feed the creek in the spring and early summer months. The trail is steep and remote and there are no facilities available. An information kiosk with maps is at the start of the trailhead.